The Columbia River Gorge is the perfect setting for windsurfing and kiteboarding, whitewater rafting or a scenic cruise. Explore this page for more information about outdoor recreation on the Columbia River. For additional outdoor recreation opportunities see the Cities and Towns of Columbia River Gorge located in the left column. Adventure Cruises. 725 Snowden Road, White Salmon, WA 98672. Toll-free: 1-800-613-2789. Portland Spirit Dinner Cruises. 110 SE Caruthers Street, Portland, OR 97214. Phone: 503-224-3900; Toll-free: 1-800-224-3901; Fax: 503-231-9089. 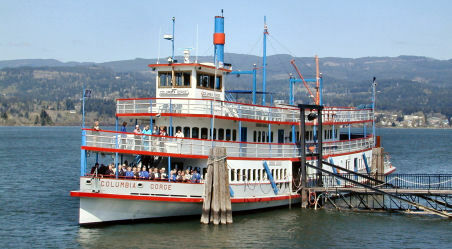 Sternwheeler Columbia Gorge. Phone: 503-224-3900; Toll-free: 1-800-224-3901. Columbia River Kayaking. 1391 West State Route 4, PO Box 52, Skamokawa, WA 98647. Phone: 360-849-4016. Northwest Rafting Company. 116 Oak Street, Suite 4, Hood River, OR 97031. Phone: 541-450-9855; Fax: 541-386-1362. River Drifters White Salmon Rafting. 856 Highway 141, White Salmon, WA 98672. Toll-free: 1-800-972-0430. Zoller's Outdoor Odysseys. 1248 Highway 141, White Salmon, WA 98672. Phone: 509-493-2641; Toll-free: 1-800-366-2004. Cascade Kiteboarding. 212 SW Cascade Avenue, Stevenson, WA 98648. Phone: 541-647-6373.